A late evening walk at Shakespear Regional Park – one of Auckland’s fantastic network of regional parks – had us strolling through the wetlands to the Waterfall Gully bush track that 15 minutes later emerged in a paddock, after which some considerable deep breathing (for me) had us arriving at the lookout – the highest point on the Whangaparaoa Peninsula. Then a leisurely saunter down the hill to Okoromai Bay when our picnic awaited. My contribution ‘Pork Char Sue’ and a chilled bottle of Tohu Pinot Rose 2016 from the Nelson wine growing region. The wine immediately hit the spot on this blue sky humid evening and even though the sun had now set behind the ridge, the wine was deliciously spritzy and quenching with its juicy bittersweet red berry flavours like cranberry and peppered strawberries and early season plums and even a touch of red gauva that came to mind after my sister suggested it. Yes!!! As for the food the pork spicy and tasty perhaps too much for the wine but the dill in the salad definitely struck a harmonious chord. 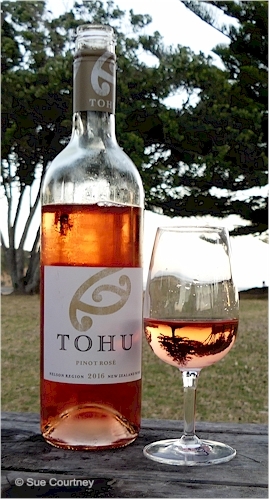 This entry was posted in #nzwine, nelson, rose and tagged 2016, Tohu by Sue Courtney. Bookmark the permalink.